Bitcoin enthusiasts will have noticed there is a lot of discussion regarding network nodes. It turns out things are not as black-and-white as assumed at first. 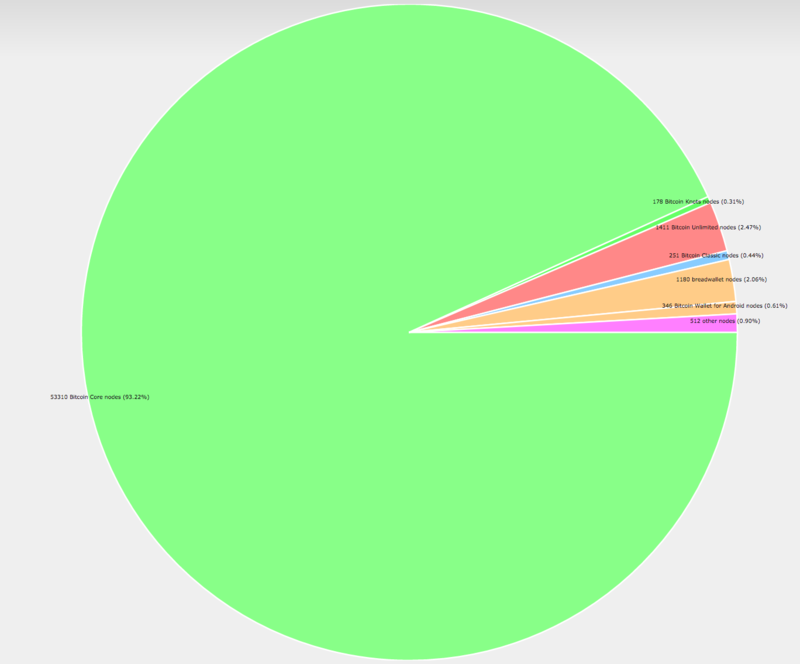 A new graph goes to show over 93% of network nodes supporting Bitcoin Core. Not all of the nodes actively signal for SegWit, but the overall trend should not be ignored. An interesting statistic that deserves a lot more attention. The bitcoin network has far more nodes than people anticipate. In fact, there are quite a few types of network nodes that hardly ever get mentioned. Breadwallet, Bitcoin wallet for Android, and Bitcoin Knots nodes are just some examples. Although these instances do not support either SegWit or Bitcoin Unlimited, that does not mean they can be ignored. In fact, they are all valuable additions to the ecosystem. This does not mean all of these Bitcoin Core nodes actively signal for SegWit, though. Instead, only a minority seem to do so at this time. Additionally, it is important to take into account spinning up extra nodes is not all that difficult. It is possible a lot of these nodes are running on a cheap VPS plan somewhere. Moreover, these numbers also include full network nodes with closed ports. It is not surprising these numbers put the Bitcoin Unlimited node numbers in a bad daylight. After all, a lot of nodes are not even supporting that project right now. In fact, Bitcoin Core has a much firmer grip on the node ecosystem than people would give it credit for at first. While it is feasible for big miners to build node farms with ease, these numbers still seem to indicate Core is the right way to go.Then again, this chart also highlights potential centralization efforts of node farms, which isn’t a good sign. If all of these other network nodes would signal SegWit support, things may look very different. Then again, it would still be up to individual miners to show support as well. Until the 95% activation threshold is reached, the status quo will continue. Metrics like these are certainly interesting, although it does not address the stalemate in the ecosystem. It does show there is much more to the bitcoin ecosystem than meets the eye, though.